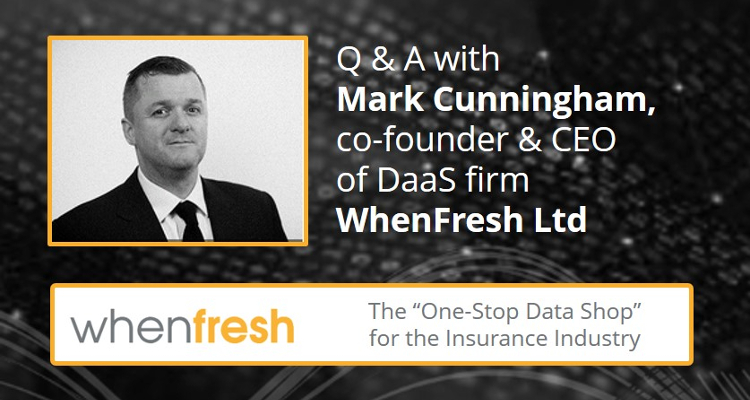 Market-leading Data as a Service (DaaS) InsurTech WhenFresh today announced a major move direct into the Insurance sector following successful series A funding. WhenFresh leads DaaS in other sectors, including Financial Services, Utilities, and Property. Bringing data together from over 200 private and public UK data sources into one place, WhenFresh offers a live, verified, fully-provenanced database of unrivalled breadth and depth. In recent years, many of the UK’s businesses have benefitted from WhenFresh’s big data solutions, which have often formed a key part of wider solutions delivered to end users via resellers and partners such as Experian, Equifax, Zoopla, CLS Risk, Royal Mail Data Services, TransUnion, and others. WhenFresh successfully secured £3m Series A funding to support accelerated product development and continued expansion into its target markets, and is now laser-focused on working directly with the Insurance sector, as its next fast-growth market. Looking ahead, and building on other sector successes, WhenFresh’s big data solutions are set to make a huge impact on the Insurance sector in 2019. WhenFresh’s Home Insurance Prefill is an off-the-shelf solution, which gives insurers 7 core characteristics on each of the 29.7m residential properties in the UK, for online form prefill and other insurance applications. The Behind the Bricks API brings instant ‘plug and play’ access to over 2bn UK property-specific data items, with a unique, comprehensive set of risk and peril characteristics in addition to the core property data of which the Home Insurance Prefill product forms part. WhenFresh is delighted to announce the appointment of specialist Insurance, Insurtech & FinTech PR agency NextGen Communications. David Morley, WhenFresh Director of Marketing & Business Development states “Many of the UK’s major Financial Service & Insurance businesses have become major users of WhenFresh data and services in recent years – but without necessarily knowing it, as we have often been part of a wider solution provided by our resellers/partners, such as Experian, Equifax, Royal Mail etc. We are now able to provide innovative and, in some cases, disruptive data-driven solutions direct to major end users, so we’ve brought in NextGen Communications to help accelerate our push into the Insurance/InsurTech space in which they specialise”. Here you can browse the current data catalogue, try out the Prefill demo, view technical documentation and set up an account (with just a name, email and self-created password) to integrate the API and start testing. Which address do you want to insure? You do not need to ask any more questions.